African sculpture takes many forms and offers us huge insights into the cultures and tribal communities from whence it came. Traditional or tribal African sculpture typically may be religious or spiritual in nature, be carved from wood, dealing primarily with the human form (and sometimes animal or mythical) and shows a creative spirit and skill that exhibits good balance, craftsmanship, attention to detail and finish and an essence of design that realizes the creator's intention. African sculpture can often be described as monumental in that the figure or form is not separated from the wood or stone from which it is carved giving it a feel of heavy permanence. The portrayal of the human form is not necessarily proportional but often strives to emphasize or exaggerate specific bodily characteristics that the sculptor is interested in communicating. They are often used as a form of communication between people and supernatural forces and beings. They are crafted by the artists and then given their power by religious practitioners who make contact with the spirit worlds of their gods and ancestors. Their purposes are very varied; bringing fertility, rain, good harvests; warding off disease, natural calamities, evil spirits; helping with social decisions and judgments; commemorating important events, making political statements. They can be extremely large to assure the well-being of an entire community and they can be replicated in a smaller fashion for individuals to be used in their private homes, giving them similar benefits. (Pendant masks). Wood is obviously most prevalent being the most malleable and readily accessible material. 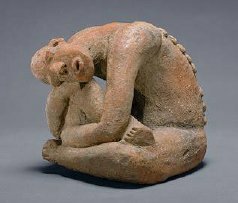 Yet the longest recorded tradition of sculpture in Africa is figures modeled in terracotta, followed in the 12th Century by the cast-metal sculptures of the Yoruba tribe of Nigeria. 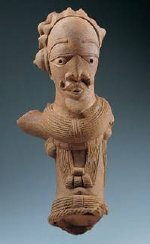 Nok terracotta figures found in NW Nigeria represent over two centuries of sculptural tradition and demonstrate that strong abstract figural representation has been a feature in Africa since the 1st C AD. Nok figures range in size from 10cm to nearly life-size. They have proportionally large conical heads, short tubular bodies and simplified faces with triangular Nok terracotta, Kimbell eyes, flattened noses and wide lipped mouths. The holes in the heads would have been to assist damage during the firing process, letting out steam and preventing cracking. Research and some supposition lead experts to think they were placed in shrines and then buried in graves as offerings to Gods. 500 years later, heads and figures were uncovered in Ife, Southern Nigeria. 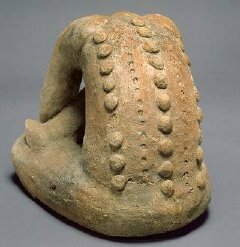 Ife terracotta sculptures date from between the 12th to 15th Century. 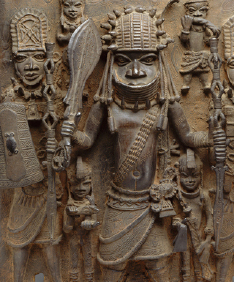 According to Yoruba belief, Ife was the site where humans were modeled in clay by the divine sculptor Obatala. 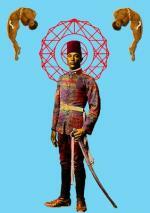 They are portraits of Onis, (kings) and are much more naturalistic in style. More recently, superb stylized human figures from the same period were discovered in Djenne in Mali from the same period as the Ife terracottas. Much further south in South Africa, the Lydenburg heads, modeled in clay in a solid, stout style with thick rolls round the columnar neck, were recently unearthed dating back to 6th C AD. Powerful terracotta figures continue to be sculpted throughout Africa. Contemporary Nok potters make ornamental figures as finials on corners of buildings. 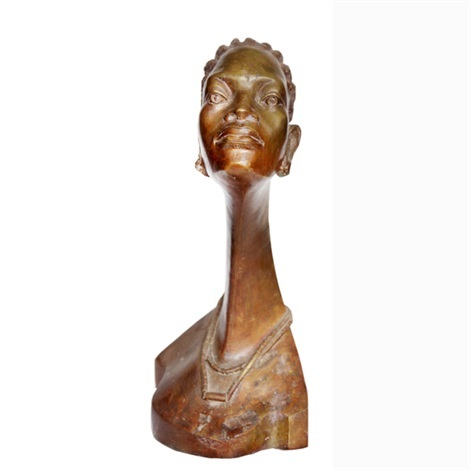 Bronze casting is a sophisticated means by which Africans have historically expressed themselves. Bronzes of very refined Ife sculptures dating back to the 12th C have been found in Yoruba shrines. The village of Igbo-Ukwu in the Niger Delta supported a bronze casting tradition that dates back to the 9th Century AD. Life-size heads and sometimes smaller full-length figures were cast in precious materials, including bronze, various copper alloys and occasionally pure copper between the 12th and 15th C.
This skill which was perfected by the Yoruba is continued in Benin from the 15th C where they are known as 'Benin bronzes'. These 'bronzes' are in fact made of brass, melted down from ornaments arriving from Portugal. Along with new raw material, arrived novel subject matter and a new style of sculpture developed which was a plaque worked in relief and depicting scenes in which the Portuguese often feature in full military garb. These relief panels decorated the wooden pillars of the royal palace. These panels and the brass tableaux made by the Fon continue to be produced in Benin today in new forms and interpretations by modern day artists. 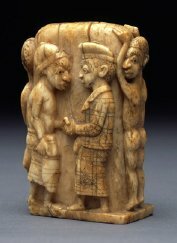 Ivory African sculpture between the years of 1490 and 1530 is a curious phenomenon as it is very influenced by the arrival of Europeans into Sierra Leone, the Congo and Nigeria. Salt cellars, spoons, forks, dagger handles were all produced using decoration of both European and African inspiration, sometimes simultaneously carved in the one piece; for example, women with European skirts and X-shaped scarification marks. This kind of carving is intricate and highly skilled and the pieces are coveted by collectors and museums. Occasionally ivory sculptures were carved for traditional African means like adorning the handle of a chief or king's scepter or as a pendant mask (a smaller version of a mask carved in replica for personal use). In the 1700's and onwards, ivory tusks known as 'olifants' were carved in intricate detail and became highly prized trophies of conquest, seized during wars and raids. It was considered highly dishonorable if the user let it be taken during battle. They belonged to rulers and chiefs and were elaborately carved with relief scenes of animal hunts and battles. The iconographic scenes help us determine whether they were produced for local use or for export. The term olifants is derived from the word elephant and they are actually wind instruments of a grand scale, used to alert warriors or hunters to danger and to signa l troops during battle. 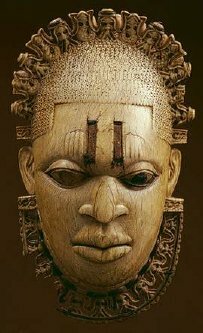 Much of the wood sculpture found today in Africa is 20th Century; it is much rarer to find 19th C, or before, if it is not preserved in a museum, simply because of deterioration of the material through termites or rot. In general, African sculpture represents human form, occasionally animal or both (as in a totem figure) and may be spiritual in nature. Most African sculpture was not created to be sold but rather was produced for a specific role which generally was one of three things; to celebrate or honor an important occasion; to make a political comment; or to represent religious ideals. Through fascination and then acquisition by foreigners, these sculptures created their own marketplace in the Western art world and were thus given monetary value. African sculpture, in all its forms, relates to a myriad of social and religious perspectives and traditions and through the study of these corporeal art forms, we can have insight into the origins of humanity and to the abstract forces that have shaped human perception. 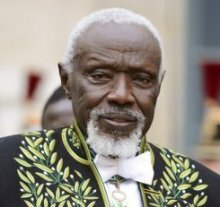 Born in Dakar in 1935, Sow moved to Paris in 1983 and returned to Senegal 20 years later. His art has been embraced by both the Western and African art worlds that recognize that he is a truly contemporary artist who personally engages with his subject matter, skillfully constructing his figurative sculptures in a craft-like, immediate way but with innovative techniques and gracing them with a monumentality that can only pay allegiance to traditional African sculpture. The 'Nouba' series were constructed during 1984 and 1987. These sculptures carry the essence of Nuba warriors, the same innate hidden beauty, strength and feeling of endurance. He also chooses other people's battles as subject matter like in 'Little Big Horn' which is concerning Native American history and is about standing up for oneself. These he worked on for 5 years from 1994 to 1999; using sculpture as a narrative and included 23 people and 8 horses in scenes of battle. His process involves neither sketches nor form studies. He builds his subject from the inside out so that they take form from the wire frame. He describes his work as such; 'Art is spiritual in conception: conceiving the sculpture and placing it in space. Also when it is finished. But between the two I think it's a physical effort. But you need spirituality to guide things towards the desired objective'. 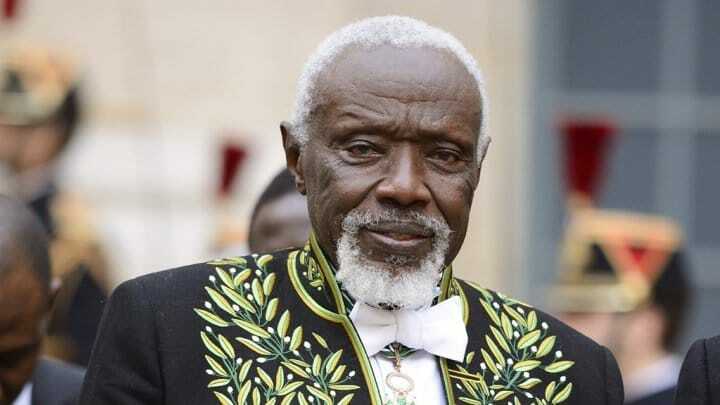 On December the 11th, 2013 Ousmane Sow became the first black man to become a member of the Beaux Arts Academy in Paris, a fitting tribute to an inspiring man and an inspired artist. Ben Osawe was born to sculpt, the son of a royal carver he grew up molding clay on the edges of the Niger River. In 1956 he left for England where he schooled along side the likes of Henry Moore. He spent another 10 years in Lagos from 1966 to 1976 after which he relocated to Benin and finally the UK where he remained until his death. His works featured natural subjects as well as abstract forms and figurative work. His stylized portraits often featured elongated necks giving his pieces an air of graceful stature, aspiring to the same qualities of beauty that his ascendants had sought to create in their sculptures. He worked in a variety of mediums; cement, wood, welded and cast metals such as bronze.